This recipe just makes summer squash so special and the star it should be in the kitchen. 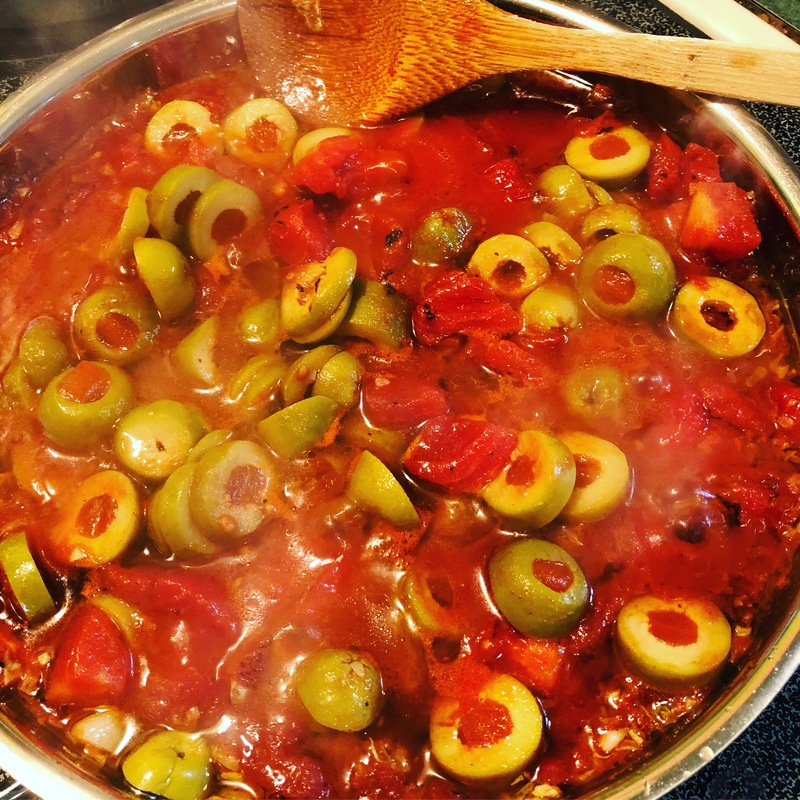 The reduction sauce is tangy and bright from the olives. 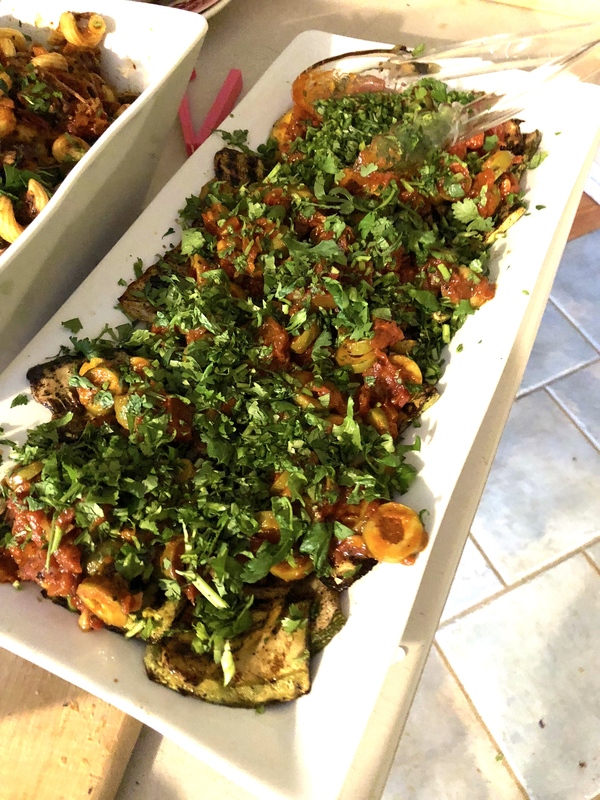 You can use any type of summer squash – the grilled planks are simply covered with a tangy and rich olive and tomato based reduction sauce… great even cold. First make the marinade – whisk together the 4 Tbsp olive oil, tamari, 2 tsp black pepper, and the balsamic. Pour into a shallow dish and rub all over zucchini planks. Heat up a panini press. (Or you can do this in a grill pan on stove or on an outdoor grill.) When the press is very hot, place the zucchini on it and press down with cover, searing the planks. 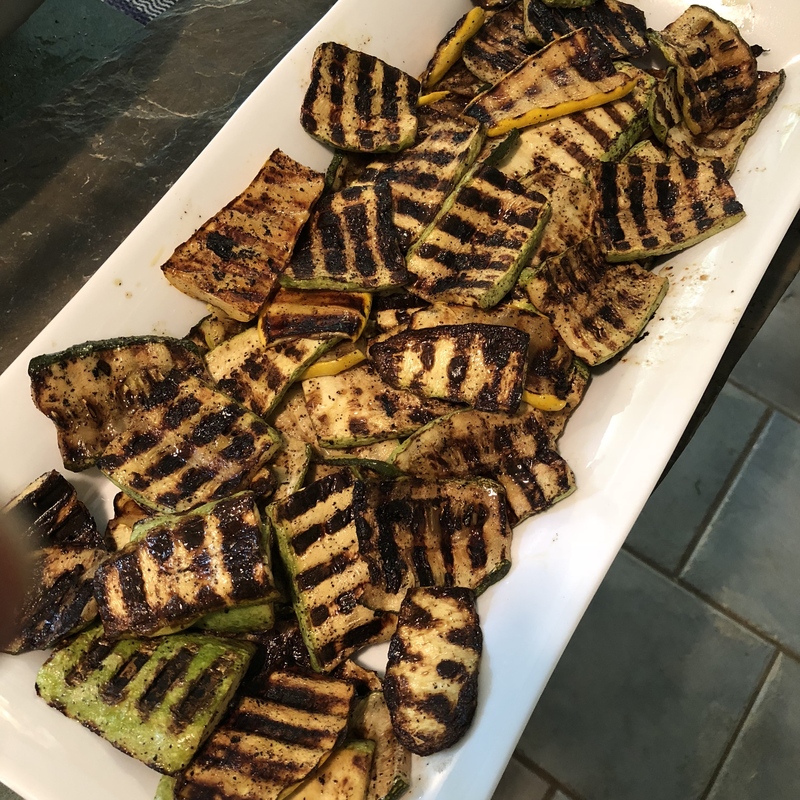 You want to get dark grill lines, but not over cook the squash. SO keep it hot and fast. Once they get good grill marks, take them off the heat and place onto the platter you will be serving this on. You may have to do this is batches. Don’t do more than a single layer at a time. To make the sauce – heat the 2 Tbsp of olive oil in a wide saute pan on high heat. Once it starts to ripple, add the garlic and brown it. Then add the tomatoes, olives, salt, and 1 tsp black pepper. Cook for 3 minutes, stirring, then add stock. Keep cooking on high heat until reduced by one quarter and thickens up. Take off heat, stir in most of the cilantro. Let settle a minute or two. Then pour the sauce over planks on the platter and sprinkle the rest of the cilantro on top. This is great hot or cold ! A perfect midsummer meal to enjoy out in the garden. This recipe involves a couple steps and takes a couple days, but it doesn’t take up too much time. For two people, you can make it in two batches saving the marinade from the first batch to make the second. It is so delicious and gorgeous and a great way to celebrate Lemon Grass* and well-grown pork**! Serve with Scallion Oil on the side or poured over the meat. You can also serve with a fried egg, pickles, or a light semi-bitter salad. Make this Scallion Oil to go with it – you’ll LOVE it! Combine in a glass jar or pyrex container and keep in fridge – it’s pretty good in a day – but it is amazing on everything in a week!!! You’ll have extra to add to salads, pour over other meat dishes, and combine into eggs! You can use bone-in pork chops or ham steaks for this recipe. We use pork from Churutabis Farm in Branchville, NJ – the farm is run by our friend Hannelie with wonderfully-treated pigs and pure, organic methods. The flavor of her pork products is divine! About 5 – 10 Lemon Grass* stalks depending on size and freshness of the stalks and your taste. Start by making the scallion oil or make it a couple days ahead of time. Then make the marinade – begin with bruising (I place the stalks between two kitchen towels and hit firmly with a heavy sauce pan bottom or a wooden kitchen mallet) lemon grass. Then chop the lemon grass along with the onions and peppers. Then combine the lemon grass, onion or shallots, ancho, chili pepper, fish sauce, XO sauce, sugar, salt, and black pepper in a food processor. Process until well chopped and smooth, adding oil to keep it moving nicely. Then I press the meat over it, making sure it has full contact with the marinade. **If you are using Ham Steaks, which is my favorite way to do this recipe, be sure to cut into the edge of fat around the steaks. See pic. This keeps the steak from curling up as it cooks. Ham Steaks are a wonderful way to eat and prepare Ham. For two people or a small family, a Ham can be a gigantic amount of meat and can take a long time to prepare. I feel it is beat to save for for big gatherings and holidays. But a Ham Steak is so much more useable. Ham Steaks are basically slices of ham. They have a center bone and sections of meat like a pie. Marinating is a great way to use this cut of pork well. It also is best cooked quickly and hotly. Always remember to cut the fat layer. I use scissors and cut it as I rinse the meat. Then I scoop more marinade over the meat, fully submerging and coating it. Marinate at least 8 hours. Overnight or two nights is fine. You can cook this on a grill, which is a traditional Vietnamese way, but I usually just want to pop them under the broiler. I use a baking rack (Stainless Steel) in a baking sheet. Put a piece of heavy duty aluminum foil in the baking sheet. You will often rip it at some during cooking, but if you don’t rip it, it makes clean-up much easier! I heat up the broiler on high and raise the oven racks to the highest point closest to the broiler element. Place the meat on the rack, leaving marinade on it. Pop the meat into the oven. Cook for 5-7 minutes on one side. You want the meat to have its edges dark, crispy brown. Then take it out and flip onto the other side. You can spoon more marinade over it if you want. We always have them for sale at our Plant Sale – both “West Indies” and “East Indies” Styles. They are easy to grow. Plant the young plants in a big pot and keep in a warm and sunny location. Toward the end of summer, you can freely harvest the stalks from around the outside of the grass-clump. Wear gloves – the blades can be sharp! Simply grasp a stalk around the base and pull out. Rinse and slice and use! To continue growing Lemongrass through the winter – it will need to be brought into the house as a houseplant or into a greenhouse. It works well as a houseplant – but feel free to give the grassy blades a trim as it can take up a lot of space! Visit our website for more recipes for cooking super-healthy foods! And check out our Courses and Workshops for successfully growing your own organic food! This recipe has quite a few steps and takes some time. Plan it for a cold and rainy day. It smells absolutely wonderful as it cooks. The flavor that is created by the initial searing and then the slow cooking is totally worth the efforts! It is also a great recipe for letting fresh herbs shine. Add plenty – I put 1/4 cup in the ingredients list, but I usually add a lot more. And save herbs for garnishing the bowls while serving – the bright freshness of the herbs contrasts beautifully with the warm developed flavor of the sauce. I really like bright herbs like parsley or basil here. Basil Micro Greens are particularly great for those times of year when you may not have fresh plants growing in the garden. Check out our Micro-Green Growing Video! As always, it is very important to purchase meat from trustworthy and organic sources. You want meat from farms who treat their animals respectfully and feed them what is appropriate for their species not what is cheapest for their bottom line. Lamb are quite easy to keep almost 100% on grass, it is fine if the farm occasionally feeds grain especially for pregnant and lactating ewes, who need a bit more nutrition. For our Farm Dinner, we purchased our lamb from Jamison Farm. Start by rinsing and blotting dry the lamb. Season liberally with salt, pepper, and onion powder. Heat up a large heavy pot or dutch oven. Add the oil to the pot and heat until shimmering. A note here – you can easily double or triple this recipe – you would just do the lamb in stages. Even with 2-3 pounds of lamb shoulder, you may not be able to fit it all in one layer – so just sear the lamb in several stages. Using tongs, place the meat in a single layer in the oil and sear well – about 3-4 minutes – until well-browned. Then flip over and sear the other side the same way. Then sear the edges for 30 seconds or so for each area in contact with the pot. Keep heat high – you want to hear the meat sizzle each time you start searing a new section. It will get smokey. Once seared all over, place the meat in a covered bowl and continue until all your lamb is seared. Turn your heat down now to medium low. Add the chopped carrot, celery, mushrooms, onion, garlic, and herbs. Use a flat sided spoon. As the juices are expelled from the vegetables, use the flat edge of your spoon to deglaze the fond, or browned goodness left from searing the lamb from the bottom of the pot. Cook until the vegetables are softened, about 8-10 minutes. Stir often. Return the lamb back into the pot now along with all the juice left in the bowl. Turn up the heat again, and once everything is sizzling strongly, pour the wine in. It should make a lot of noise. Stir and scrape the bottom. Cook for about 2 minutes or so and then add the tomatoes. Bring it toa boil, and then turn down the heat to low, cover partially, and cook, lightly simmering, for about 3 hours. Turn off the heat. The lamb should be falling off the bone. Carefully move it, using tongs, into a clean bowl and let cool a bit. Once the meat is cool enough to handle, pull it apart and shred it. You want it be like a pulled pork size rather than chunks so it spreads consistently throughout the sauce. I usually use my hands for this – plus with shoulder cuts you can get loose (and sharp!) bone pieces which you want to be sure are all removed. I usually stir though the sauce carefully checking for bones as well. Toss the bones and add the meat back into the sauce. Taste and adjust for seasoning. Serve over a pasta that allows the thick sauce to cling to it – I love radiatori or fusilli with this although it is classic to serve with a pappardelle. And it is stunning with mafalde! You can add grated cheese if you want as well! For our full menu and more Table-in-the=Field recipes, click here! For info on our Plant Nursery, specializing in herbs and heirloom vegetables, click here! More info on our Poultry Raising can be found here! At Our Midsummer’s Eve Table in the Field Dinner in 2018, we served this recipe as a purely Duck Liver Terrine (from our own home-grown ducks, butchered a couple days before) with a variety of grainy crackers and hearty breads and a Light Frisée Salad dressed with a mild vinaigrette. You can make it with chicken livers and it comes out lovely as well. The Duck Livers may it a bit more buttery and richer. You can also combine the two types of poultry livers. Organic is Super-Important here – Make sure you use organic chicken livers – they should be a nice purple-brown color. Non-organic livers are a tan color and as detoxifying organs, they are concentrates of chemicals and other nasty things. I love terrine and paté and believe that liver is a very important and healthy super food. Having high quality and clean livers on hand is a big reason why we raise our own chickens and ducks. Start by bringing the water to a boil in a large pot. Separate the parsley into two smaller bunches and chop one bunch coarsely. Once the water is boiling, add the celery, non-chopped parsley, and 3 tbsp of the black pepper. Let simmer for about 5/6 minutes. A note on parsley: I always feel like I’m cheating when I talk about adding fresh parsley to a recipe. We grow an amazingly flavored parsley that seems to make every recipe shine. It was originally from Italian Heirloom Seeds and we’ve been growing and developing it and saving the seeds for over ten years. We always have plants available at our Plant Sales and this year we will also have seed for sale! Then add the livers to the water. Note: you don’t need to go crazy with prepping the livers. I simply give them a rinse with water. In many recipes, you are asked to cut sinews and stringy things off the livers, but because we’re processing this up very well, it is simply not necessary. As they simmer, you will notice some foam gathering on the water. I usually scoop this out and toss it. After livers have boiled for 10 minutes, drain them. Let them cool a tiny bit just so you can handle them. You do need them quite warm for processing. At this point, I put some of the celery and parsley from the boiling water into the food processor along with 2 tbsp of the butter. I add about half the livers. Process and grind these a bit, then add some oil and more livers. Process again until they are moving decently in processor. Then add the rest of the livers, the other 2 tbsp of butter, and the onion. Add oil as necessary don’t pay a lot of attention to the amount, go with what seems right. Again, process well. Take the time to open the machine and scrape down the sides and pulse the processor. The difference between a delightful terrine or pate and a weird one is getting the livers very smooth and velvety. Once you’re sure it is smooth and velvety, scoop into a bowl. I’ve tried pouring this into a mold, but have never been thrilled with how it looks… You’ll know you processed it enough if it has a little spring to it as you scoop. Put in the fridge at least overnight, two days is even better. It just tastes better and better as the flavors get to develop over time. Great served with course and grainy crackers or a hearty bread. I love it with a bitter greens salad – like frisée and dandelion. Dress the salad with light vinaigrette of Olive oil, vinegar, lemon juice, salt and pepper. It is truly a delightful meal for any season. This is a tasty and spicy treat; great in the summer or the winter. You can use coconut milk instead of heavy cream, if you want to avoid diary. The final chowder is brightly colored – very festive – and smells and tastes delicious – addictive even! You can get very creative with the vegetables – this is how I prepared it for our Midsummer Eve’s Table-in-the-Field Dinner on July 28th 2018. It is one of our most-requested recipes from that evening! Start by adding the water and wine to a big stock pot or dutch over and bring it to a boil over high heat. Once it boils, bring the heat down a notch and let it settle at a rolling boil with cover ajar. Meanwhile, clean your mussels – give them a good scrub and pull off any beards. Add the mussels all at once to the boiling water and cover fully. Leave cover on for 4 minutes. Then check on them – give them a stir and if it seems some are still closed, put cover back on and let them go another 2 minutes. Take pot off heat. Scoop mussels into a large bowl to cool – you don’t want them to over cooks at all because you’ll be re-heating them again later and you don’t want them to get rubbery from being overcooked. Save your mussel water – that’s a huge amount of flavor! But you do need to strain the liquid to remove any sand or sediment left behind. Let it settle and restrain if necessary. This mussel broth will be a cloudy greyish color. You should have at least 4 cups – if you don’t have 4 cups, add a little water. If you have more than 4 cups, then use it all! Process your mussel meats – I like to save out about 20 or so mussels in their shells. Pick out nice small ones. But then take the time to remove the rest of the mussel meats from their shells. Two many shells in the chowder will make it hard to serve and uses up two much sauce with shell. But I feel like you need the drama of a couple shells to make this chowder really pop! Throw away any mussels that did not open – these are the bad ones. The above steps can all be done a day or so ahead and refrigerated. Prepare your vegetables – cut potatoes into bite size pieces that match one another in size as much as possible. I like to cut the carrots into rounds. Cut the peppers into pretty big pieces as they shrink a lot and can get lost in the curry. Cut the leeks pretty small and I usually slice the shallots into rounds. Heat butter in a Dutch oven or heavy stock pot until melted then add potatoes. Salt liberally and stir and cook over medium heat for about 5-7 minutes. They smell awesome! Then add the carrots, peppers, leeks, and shallots. Cover the pot and let cook for about 12 minutes. I usually test a large piece of carrot to see if it is just-about tender. Once the carrots are almost tender, add the garlic and the spices including plenty of black pepper. I usually give it another sprinkle of salt now too. Cook for another minute or so with cover off, turn up heat a bit to get mixture sizzling. After adding the cream, adjust the heat – you don’t want it to wildly boil at this point – you want a very gentle simmer – then add the mussel meats. The mussels are fully cooked at this point, but you want to allow the mixture to meld flavor-wise – let it cook gently for about 3 minutes. When you are ready to serve, reheat gently and sprinkle with liberal amounts of the chopped parsley and cilantro. Serve with a crusty bread for scooping up every last drop! Visit our website for more recipes from this Farm Dinner Event! We just finished processing our meat chickens for the season, and we had a great year for cabbage, so one day last week I pulled together a recipe for using the left chicken meat from a roast bird along with some chopped cabbage and a leek that also was just ready for harvesting … and it turned into a great meal! If you don’t have cabbage, then Swiss Chard or Spinach or even Escarole or Endive would work well – actually, I think the bitterness of the chicory family greens would complement these flavors in a really lovely way. Directions Start by preparing the béchamel – Put the milk and bay leaves into a small saucepan. Heat over medium-high heat, until little bubbles just start forming along the sides of the milk. Then, remove it from the heat and cover – let it sit and infuse for at least 10 minutes. In another medium saucepan (the heavier the better for this part of the recipe), melt the first 1 tbsp of butter over medium heat. Add the leaks and cabbage and sauté until softened and sweet. Scoop leeks and cabbage out of pan into a bowl and set aside. Then add the second 1-1/2 tbsp of butter to pan, and melt over medium heat. Add the flour, and whisk or stir, letting it bubble but not burn for 3 minutes or so. Strain the hot infused milk into the butter mixture, discarding the bay leaves. Keep stirring until the mixture thickens to a nice consistency similar to heavy cream. If it gets too thick, you can add a dash or two more milk. Stir in the garlic, chicken meat, leeks, and cabbage. Heat thoroughly, and add salt and pepper to taste. Dust with nutmeg. And enjoy! Check out this Buttered Cabbage recipe – It is delicious – imparts a similar comfort-food feeling as pasta – truly! And very good for you especially if you use butter from pastured, grass-fed cows. So good and so healthy! Cabbage is one of the healthiest foods on the earth. Click here for other healthy sauté recipes on our website. I feel like I just became re-acquainted with simple hard-boiled eggs. And suddenly, I can’t get enough of them! Consider raising your own flock of laying hens and get your own fresh and naturally-diverse organic eggs! Our next Poultry Workshop here at Midsummer Farm will be on June 18th 2017. See more info and register here. We are also currently developing an on-Line version of our Poultry workshop – to come Summer 2017. Hard boiling is often considered difficult to do with truly fresh eggs. When an egg is fresh (meaning laid a couple days ago, not bought in the grocery store), there is almost no air between the white and the shell. This lack of air space makes fresh eggs very hard to peel. You end up pulling a lot of white off with the shell, and the end results look messy. You can find a lot of very different – and sometimes insanely time-consuming – instructions for how to go about hard boiling a fresh egg and being able to gracefully peel it… They all work sometimes. This is how I usually go about hard boiling… most of them will peel ok, but you’ll still get some messy ones. They will still taste great even if they look messy! For regular sized chicken eggs, refrigerate them first, so they are cold. Then place the eggs in a single layer on the bottom of a pot of water and fill with cold water. There should be about 2 inches of water over the tops of the eggs. Take the cold pot and heat on high until it boils. Allow them to boil for 2 minutes. Then take them off the heat and let rest 2 minutes. Then run them under cold water until they feel cool to the touch. I usually bounce them a bit here, letting the shells crack. For bantam eggs – Allow to boil only 1 minute; let rest in hot water 1 minute more. For duck eggs or jumbo chicken eggs – Allow to boil 3 minutes; let rest in warm water another 3 minutes. After peeling, I simply cut the hard boiled eggs in half. My goal is to get the yolks dark, velvety, and vibrant with the whites being tender and sweet. I found that sprinkling a bit of colored sea salt or smoked sea salt just brings the flavors out and is perfectly sublime.